Whenever I travel to another country, I have some guidelines that I try to follow. This, I believe, is the very minimum that a tourist should learn. Memorize them and try to pronounce them correctly. I usually have a cheat sheet that I carry around. Beyond that, I try to count to ten, say where I’m from, and learn what gesticulations I shouldn’t do. Second, I try to respect the people who live there. There are so many ways to do this. Among them is to not photograph them without their permission. In my case, I just avoid photographing strangers. I try to be as polite as possible with beggars and people selling you stuff. Also, Cambodia, is a conservative society, so I kept my tank tops to a minimum, especially around the temples. And T and I avoided public displays of affection. Third, I research the history and politics of the country so I can put the whole journey into context. So the following is a very, very short outline of Cambodian history as I understand it. All of the ancient ruins were built during the Khmer Empire (802-1432CE) which at its peak included most of present-day Thailand, much of Laos and quite a bit of Vietnam. In its early history, Hinduism was practiced but later Buddhism began supplanting Hindu influences. 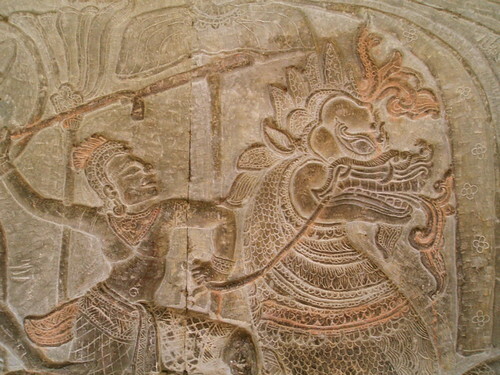 At the end of the Khmer Empire, the northern half of Cambodia, including Angkor, was controlled by Thailand, and the southern half was often occupied by the Vietnamese. During colonial times, the remaining southern kingdom ceded sovereignty to the French in 1863. This lasted about 90 years. Once independent from France, the short-lived kingdom enjoyed stability under a monarchy until the U.S. instigated a military coup to bring Cambodia into its orbit during the Vietnam War. What happened after is beyond tragic. The coup led to a long and bloody civil war, with Pol Pot’s Khmer Rouge upending the U.S.-backed military junta. During Pot’s rule, about 25-30% of the population was murdered by the new government. The Khmer Rouge was modeled after the disasterous Chinese Cultural Revolution, wherein old societal influences were eradicated in favor of a completely new society based on agrarian communities. All professionals, including teachers, scientists, artists and bureaucrats were executed. Anyone who spoke a foreign language or even wore glasses were likewise done away with. The tragedy was only stemmed and in some ways compounded when Vietnam conducted a 14 year invasion of Cambodia and installed Heng Samrin as the new leader. Years of occupation and another civil war resulted in hundreds of thousands of refugees camped along the Thai-Cambodian border. In 1993, King Sihanouk was reinstated and the U.N. organized elections that led to a democratic government. This didn’t last long as Hun Sen led a coup that toppled the new government. The most recent elections in 2003 kept Hun Sen in power and that’s where we are now. Update: I was taken to task by one of my friends who is studying the impact of land mines in Cambodia. She felt I glossed over the impact of the U.S. on modern Cambodian history. I readily admit this. Although, in my “brief” history of Cambodia, I really glossed over so much more. It was meant to just paint a very broad sketch and bring the reader up to the state of Cambodia now, the time period that I visited. And for the record, I did imply that the U.S. involvement in dethroning the Cambodian king led to the decades of atrocities and civil war. Might I also add now that the U.S. and Viet Cong fought extensively in Cambodia, in effect invading it. And the U.S.’s tactics were especially egregious.